In the middle of autumn there is nothing better than venturing down to the Mornington Peninsula for the weekend. A mere 60min drive from the centre of Melbourne with tunes a blaring and you have found yourself at peace amongst market gardens, vineyards, national parks, beaches and undulating lush green pastures. A very different proposition to summer when it is overflowing with preppy teenagers, blonde mums and Toorak tractors. There is a raft of quality restaurant offerings, mostly accompanying wineries; for example – Ten Minutes by Tractor, Foxeys Hangout, Montalto, Veraison, Port Phillip Estate inter alia. However, on this occasion, we opted for the Peninsula’s newest option – the recently renovated Flinders Hotel – http://flindershotel.com.au/ which is the latest in a line of seriously revamped quality country pubs, best epitomised by Dan Hunter at the Royal Mail at Dunkeld – http://www.royalmail.com.au/ – a must visit. I recall, many years ago, sitting in the beer garden of the Flinders Hotel, a teenager enjoying a pot of Carlton and the ubiquitous chicken parma, after a round of golf at the nearby course (which is spectacularly positioned along the rugged shoreline of Western Port). 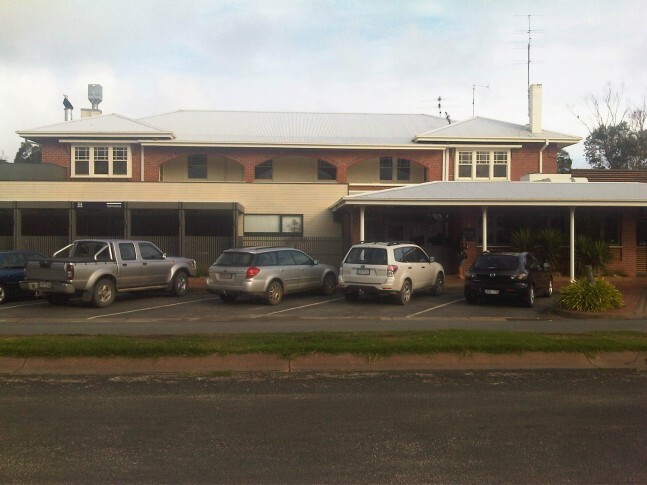 Then, the town of Flinders, was a very quiet cross road with a pub and general store. Today, it’s still small, but home to a few swank galleries, shops purveying local produce, home wares and craft. 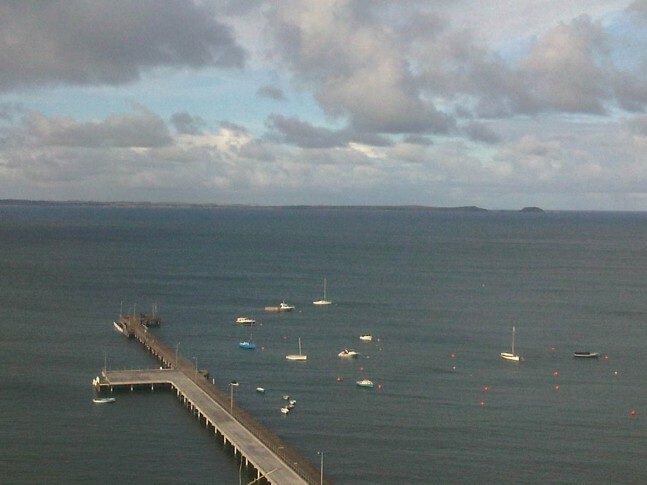 Flinders, named after the famous explorer, Matthew, was founded in the 1850’s as a fishing settlement. Completion of the telegraph cable to Tasmania in 1869 brought boom times to Flinders. Cable station staff comprised a substantial part of the population, and the mainly male staff members became involved in cricket and football. The substantial 2011 redevelopment of the Flinders Hotel into a destination restaurant takes it back to the boom times. There are two dining options 1) The Deck – traditional relaxed pub/ bistro food (perfect for families with an adjacent playground, and 2) The Terminus – refined fusion of local produce with French perfection and North African flare. The warm open fire drew us into the Terminus where Chef Pierre Khodja (born in Algeria, raised in the south of France and trained in Paris and London) partners with talented sommelier Clinton Trevisi (ex Royal Mail). I was driving, so unfortunately, only the one bottle of wine was ordered, but we will return when the accommodation is complete and give the eclectic wine list a decent crack, 2009 Moorooduc “ The Moorooduc” Pinot Noir, the top cuvee from Mornington’s small hands on family run Moorooduc Estate … cherry red, savoury spice, ample structure and fine texture. The wine evolved wonderfully through our lunch. 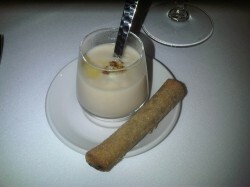 A delicate amuse bouche was brought to our table – Celeriac Soup with Apple, and a Mushroom Borek – pearls of crisp apple cut through the rich and creamy celeriac puree. The cigar shaped mushroom borek provides an earthy and flaky juxtaposition and suitable dunking tool. A great start. The menu is small, elegant and very seasonal. Autumn on the Mornington Peninsula is famous for its mushrooms (the subject of my next article). 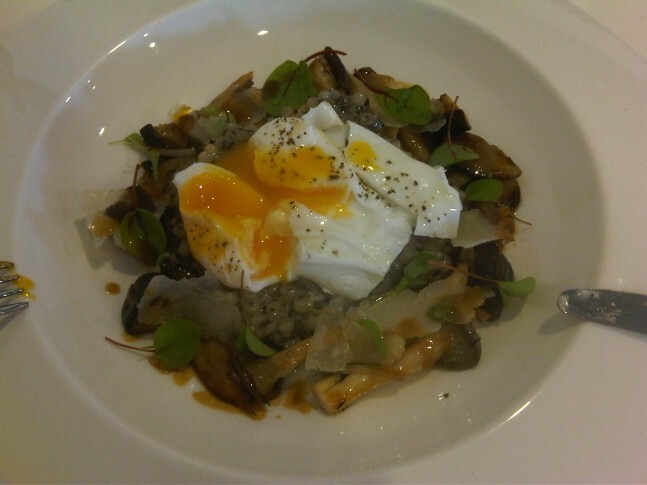 Hence, we can’t go past – Sautéed Wild Mushrooms, Pearl Cous Cous, Poached Egg – breaking the runny yolk sets up an autumnal explosion; risotto like cous cous carries the delicate forest floor flavours of the wild mushrooms while the yolk adds richness and decadence. Our wine matches perfectly the earthy and savoury tones. However, theses plates are always too small, a tease and hence you hanker for your home version where you pile high a sauté pan full of wild mushrooms upon a butter soaked piece of ciabatta … and enjoy seconds and thirds!! We eagerly await the mains, of which we promise to share with each other, because we were genuinely tempted to order the same dish twice; the rabbit sounds amazing, but being the polite subservient male, I opt for duck and hope for a mid meal trade. Roasted Duck Breast, Lentils, Sencha Sauce – crisp skin, rendered fat and plush gamey rare flesh melt in the mouth. And one doesn’t need to mention how well pinot goes with Duck. A triangle of duck pastilla accompanies, sweet and salty flavours help mop up the lentils in sencha sauce. Awesomely autumn! 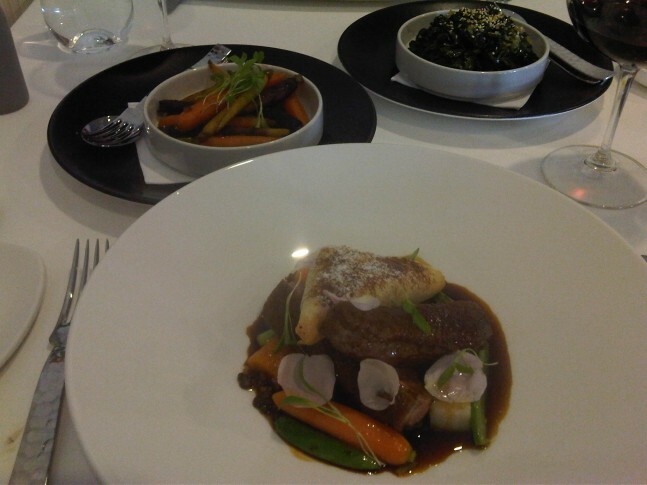 Roasted Rabbit, Foie Gras Dumplings, Raisin Jus – the dish we fought over and we were not disappointed. The rabbit is deboned, stuffed, rolled and roasted with rabbit mince and subtle spices of North Africa. Our society does not eat enough rabbit – it’s a wonderfully fine white meat and it’s very cheap and abundant – indeed its vermin (arrived with the First Fleet, but its population exploded in 1859 at Barwon Park when Thomas Austin released 12 for hunting – the population peaking at 600 million in the 1950’s – and today ~200 million). The foie gras dumplings were a perfect indulgence, a lightly fried skin encases the unctuous core and while opulently rich they are deceptively light. 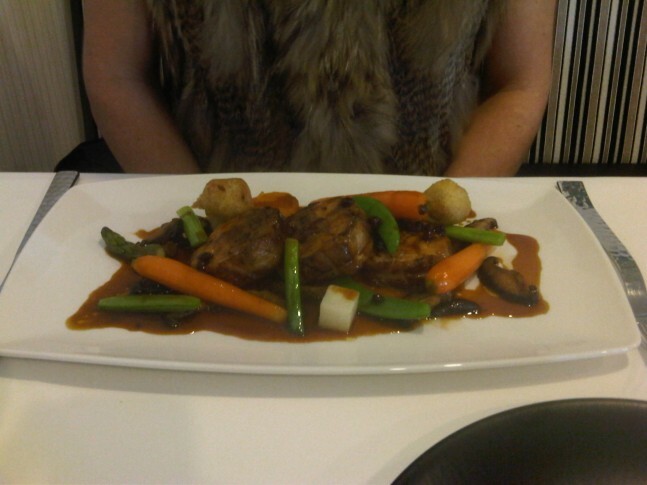 Note also the irony of the dish – the diner cloaked in rabbit fur! Side dishes were Spinach, Ginger and Preserved Lemon – wilted greens perforated by the tang and salt of lemon and the zing of ginger. Roasted Carrots, Cumin and Honey – sweet heirlooms delicately spiced and coated in bee essence. 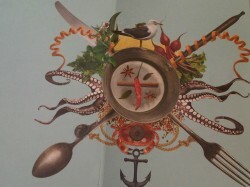 Chef Pierre’s North African background is subtly manifest in the dishes of Terminus, Flinders Hotel. Often such spices can overpower classic French cooking, but his deft hand brings a welcome dimension to the dishes. 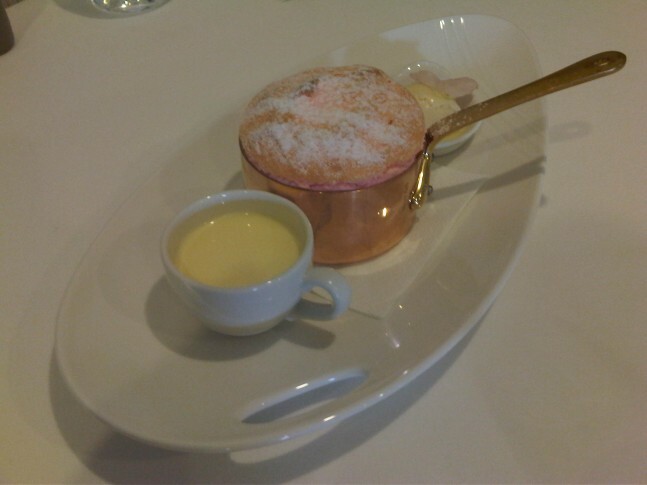 We both look each other – a full belly, a warm glow and comfort all round – but we surely can’t miss the Turkish Delight Soufflé, Lychees, Halva Ice Cream – a spoon of ice cream cuts through rose petals and fluffy bubbles of air. Then hiding at the bottom of the copper pot are small half melted morsels of classic turkish delight. What a wonderful dessert!! So engrossed and pleased with our lunch that the petit fours disappeared into enjoyment before a photo could be snapped – but think miniature chocolate ice cream truffles with hints of Algeria.